of Woodlands Works, Wood Lane, Bow, London. 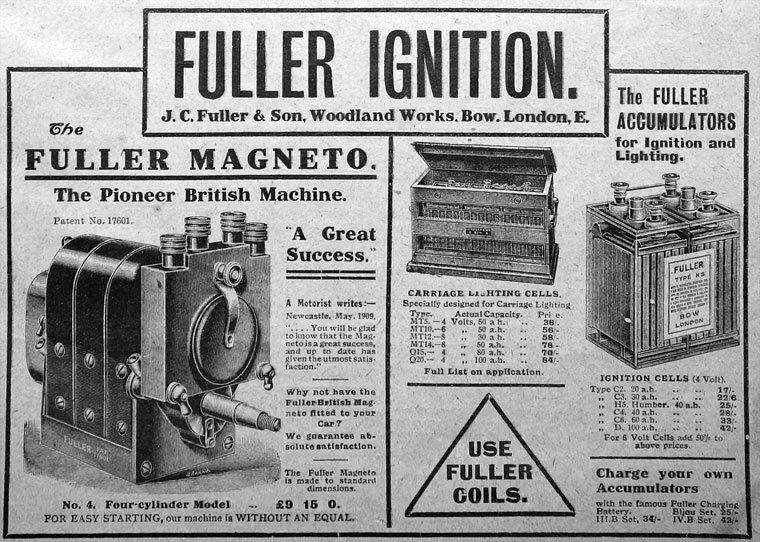 1875 As a result of the success of his battery invention, John Crisp Fuller formed the firm which became John C. Fuller and Son, of Bow. 1895 G. J. A. Fuller and Leonard Fuller, of Woodlands Works, Bow, were admitted as associates of IEE. Leonard Fuller invented the "Block Accumulator", a more reliable form of accumulator especially valued for use by the railways. c.1911 John C. Fuller died, still experimenting with his electrical equipment. 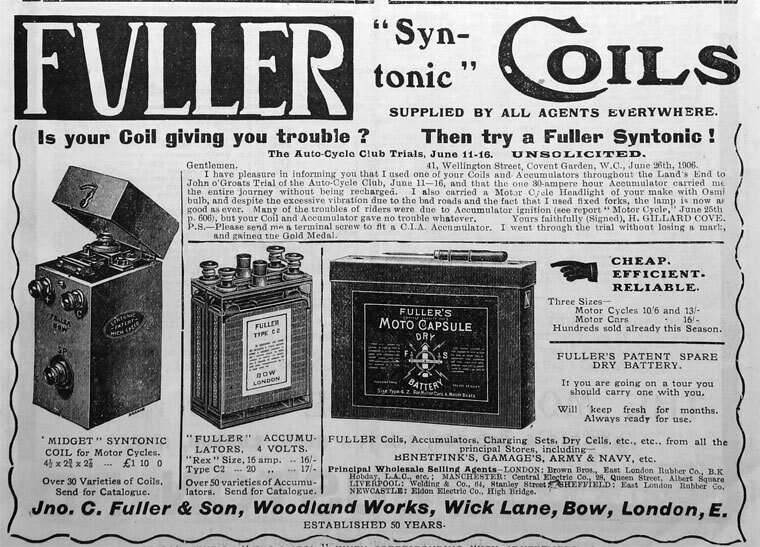 c.1914 A subsidiary, Fuller's Wire and Cable Co Ltd., was formed in a separate factory at Chadwell Heath to manufacture wires and cables for all electrical uses; during WWI started manufacturing Ebonite in its rubber works when supplies from Germany were not available. 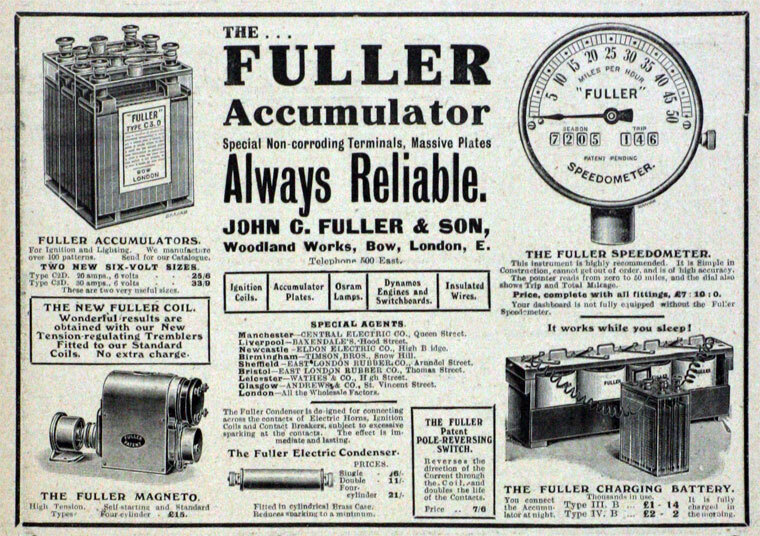 1915 the Fuller Accumulator Co was formed to develop the Block type of accumulator. The starter and lighting accumulators were sold under the tradename Sparta. 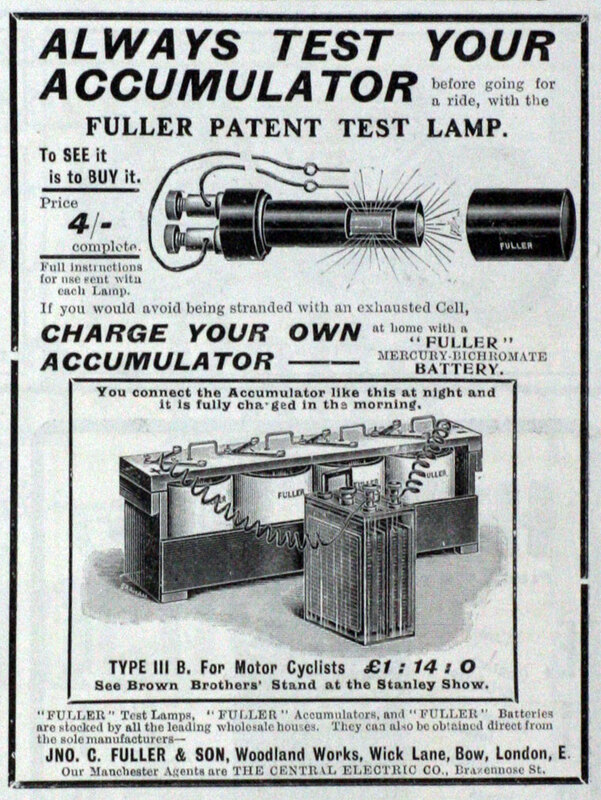 J. C. Fuller and Son continued making primary batteries, including the Dry cell and a later development called the Inert Cell, which was more durable for use in hot countries. c.1918 Formation of subsidiary Fuller's Carbon and Electrical Co Ltd., making carbons for electrodes for flash lamp batteries to electrodes for arc lamps as well as for use in steel making. Also made carbon black from waste products and the residue was sent off for use in paints. 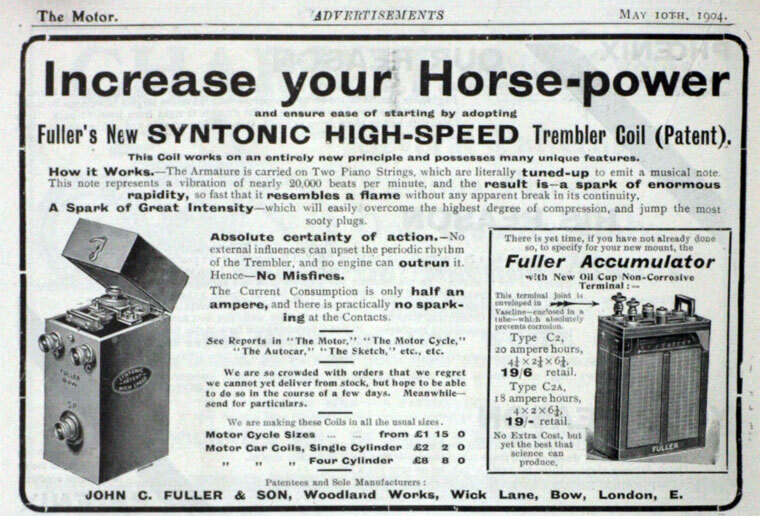 1919 the 4 companies were brought together again as Fuller's United Electric Works Ltd, making batteries of all types from hand lamps to large units for town lighting. This page was last edited on 9 January 2017, at 14:28.